SAHA - South African History Archive - NOW YOU HAVE TOUCHED THE WOMEN YOU HAVE STRUCK A ROCK:YOU HAVE DISLODGED A BOULDER;YOU WILL BE CRUSHED. NOW YOU HAVE TOUCHED THE WOMEN YOU HAVE STRUCK A ROCK:YOU HAVE DISLODGED A BOULDER;YOU WILL BE CRUSHED. Theme: You strike the women, you strike the rock! Title: NOW YOU HAVE TOUCHED THE WOMEN YOU HAVE STRUCK A ROCK:YOU HAVE DISLODGED A BOULDER;YOU WILL BE CRUSHED. Description: This poster is silkscreened in marbled black with green and yellow. It features the image of a woman holding up a piece of broken chain. 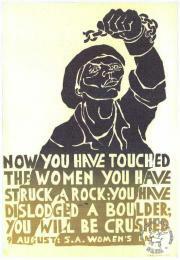 The text reads: "NOW YOU HAVE TOUCHED THE WOMEN YOU HAVE STRUCK A ROCK:YOU HAVE DISLODGED A BOULDER;YOU WILL BE CRUSHED : 9 AUGUST: S.A. WOMEN'S DAY" Digitised by Specialised Archival Solutions in 2009. Reproduced in "Images of Defiance: South African Resistance posters in the 1980s" on page 11 (number 15) of the 1991 SAHA / Ravan Press edition and the 2004 SAHA / STE Publishers edition. It also appears on page 122 of “Red on Black: The Story of the South African Poster Movement”, SAHA / STE Publishers, 2007.Additionally this poster can be found in the SAHA Exhibition Kit, under Women.Duplicate poster: AL2446_3580.